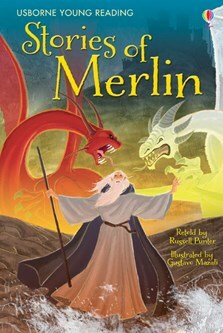 Listen to a story about Merlin as a young boy. Read about Arthur and Guinevere's wedding, and find out the story behind King Arthur's famous round table. Three thrilling adventures telling the story of the legendary wizard, specially written for children who are starting to read on their own. Stories follow the mighty wizard as he outwits a cruel king, faces fearsome dragons and guides a prince to his destiny. With easy-to-read text and vibrant illustrations to capture the attention of even the most reluctant reader. Developed in consultation with reading experts at Roehampton University to help young readers grow in confidence and ability. Four short stories about dragons are well read with great sound effects.